Want to gain an easier way to create floor plan in Excel? Here is the solution. 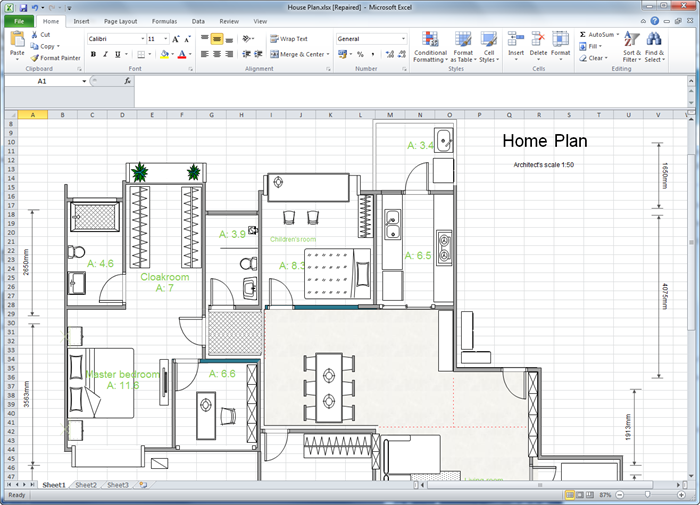 Our program helps you make a floor plan and save as Excel file instantly. It runs on all major platforms: Windows, Linux, and Mac OS X. 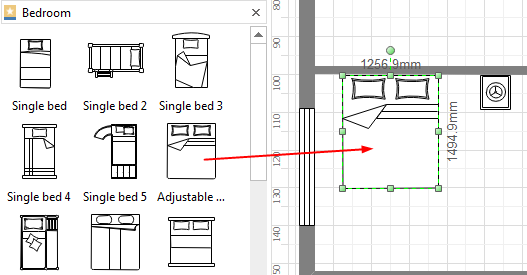 Designing a floor plan and displaying in Excel is super easy using Edraw. The floor plan solution includes symbols and templates that are tailored for floor plan. What you need to do is to pull these symbols out and customize them according to your purposes. When it's done, one more click on the Export button, you can convert this file to Excel XLSX format, with everything showing perfectly. Edraw is working well not only on Windows, but also on Mac OS X and Linux systems. A floor plan is a drawing that shows the arrangement of a room as seen from above. All things in a floor plan appears flat. Architects or designers use floor plans to present what a room or building will look like. The floor plan guide the architects to construct the building based on desired structure. With an extensive collection of accurate, ready-to-use floor plan symbols and templates, you are able to make presentation-quality floor plan effortlessly, with no prior experience needed. On the File menu, point to New, choose Floor Plan and then double click the icon of your desired floor plan type. Drag and drop shapes to create the basic exterior wall structure. Resize walls by dragging an endpoint. The endpoints turn red when the walls are glued. Intersections between two walls get cleaned up automatically. Create the interior wall structure. Add other structural elements, including doors and windows. Add electrical symbols, furniture and decorators like plants. Apply quick styles and theme for professional quality result. Note: All shapes are smart floor plan symbols that are attached with dynamic scale. When you edit the shapes, the dimensions show automatically. This help you resize shapes more accurately. Creating floor plan in Edraw is a breeze. Exporting floor plan is also a super-easy job, which needs only some simple clicks. Seeing is believing. Have a look at the above exported floor plan. It is very clear and fully editable. As it is vector format, it can be zoomed freely while keeping high resolution. 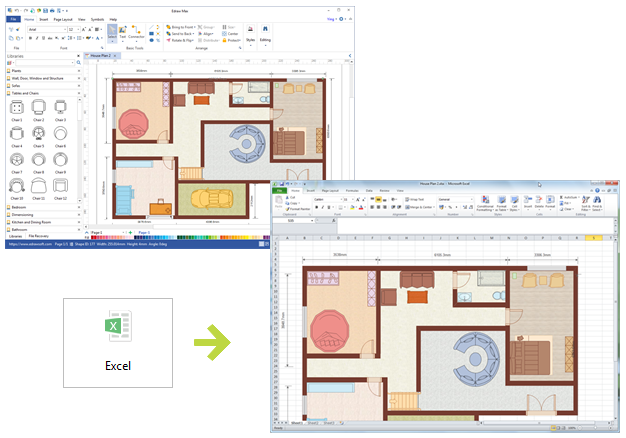 When a floor plan is finished, go to File tab, click Export button and choose Excel to save your file as XLSX format. Discover why Edraw is an excellent program to create floor plan. Try Mac Floor Plan Software FREE. The exported floor plan will remain the vector feature in the MS Excel. You can continue to edit text and shape, and apply quick style in MS Excel.